For anyone who hasn't noticed, Nick moved my Major Sci News Blog to the Resources board. Clovis Comet? Younger Dryas Impact Hypothesis Gets a Bayesian Beating ~ and Survives! Missing mass - what is causing a geoid low in the Indian Ocean? Why are so many fossils of woolly mammoths young males? Living With Gods review – 40,000 years of religious art, and this is it? Origin of Gold: Was it asteroid impact or some mysterious particle? At this page http://funday.createaforum.com/1-10/k/ I collected info about deep boreholes. This link http://geologycafe.com/images/igneous_provinces.jpg shows sedimentary basins worldwide. Some of the basins are very deep. The Caspian is about 23km deep. It seems that the basins would have been large, deep lakes before the Great Flood occurred. Sedimentary rock strata are said to average about 2km depth on the continents. The lake basins must have been filled in with sediments during the Great Flood, caused by tidal megatsunamis due to a large close-orbiting object. The 2km deep sedimentary rock on the continents was deposited during the Flood as well. But the Kola borehole had mostly granite under the sedimentary rock that was fractured. And some of the granite was sedimentary and below 9km was metamorphic. And plankton (microscopic ocean plants & animals) fossils were found in the granite at 6.7km depth. So I wonder how the granite became fractured and how the fossils got into it. The crust is commonly thinned in basins. It has been discovered by seismic and gravity anomaly methods that the crust below a basin is commonly thinned. Artyushkov states: “Considerable thinning of the crystalline crust occurs under most deep basins located on continents.”15 Along with a thinned crust, the Moho, the boundary between the crust and mantle, is commonly raised (see figure 2). Figure 2. 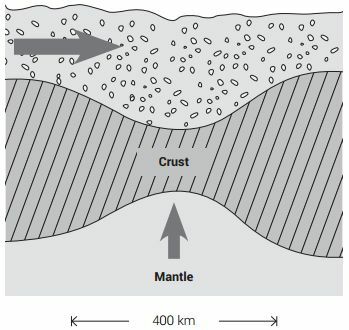 Schematic of the thinned crust and uplifted Moho, the boundary between the crust and mantle, typically beneath an impact crater right after formation. Caspian Basin Cross-section shows the basin is about 23km deep and the crust under the basin is about 30km deep, whereas beyond the basin it's 50km deep. There's no basin at the Kola peninsula, but the Barents Basin is just north of it, so I wonder if the nearby basin was formed by an impact, which fractured the granite on the Kola.